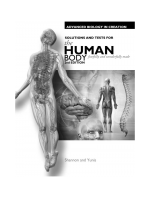 Solutions and test manual for Advanced Biology: The Human Body 2nd Edition prepares students to take the Advance Placement (AP) or College Level Examination Program (CLEP) tests. This advanced biology course covers both the anatomy and physiology of each of the human body's organ systems for those students who have successfully completed high school biology and chemistry. The softcover solutions-and-tests manual contains answers to module study guides, tests, and test solutions. A booklet containing an extra set of tests is shrink-wrapped with the manual.